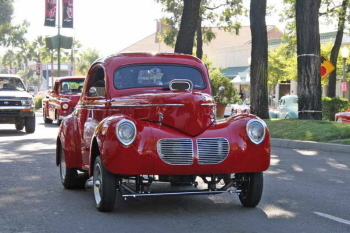 Every Friday evening along a four block stretch of Grand Ave in “Historic Downtown” Escondido, hundreds of pre ’74 Street Rods and Classic Cars gather. 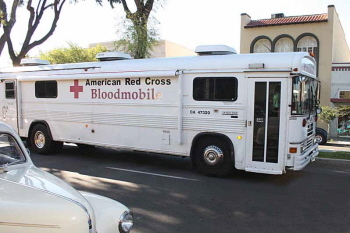 Approximately 400 cars park along the streets and in the parking lots along Grand. Between 5 – 9 the cars begin “Cruisin’ Grand”. DJs keep the 50’s and 60’s music coming all night. A super sound system has been placed permanently in the median strip down the middle of Grand. Additional activities such as music trivia or car trivia contests are announced by the DJs, contributing to Cruisin’ Grand’s reputation as a family event. There are lots of shops to explore along this very attractive stretch of Grand Ave, the restaurants are very nice looking and smell great! The heart of the event is the intersection of Grand and Broadway. 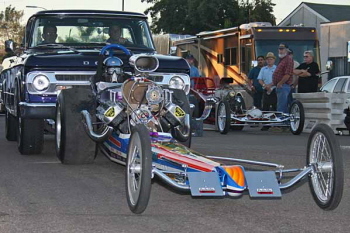 The award winning cars for that evening are staged on Broadway as well as car clubs and special events. Tonight the special event is “Nitro Night” presented by SDP&G, Minshew Steel, Castrol, Orange line Oil, and Firestone. Bill Pitts expertly presented the event, which was simultaneously shown on a 12 foot x 12 foot screen. Historic film footage was also being shown on the screen. 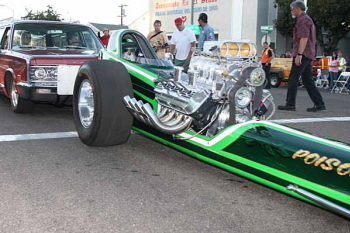 Over 15 front engine Nostalgia Top Fuel Dragsters and a Nostalgia Top Fuel Funny Car all running on Nitromethane fuel fired up. Two at a time they drove to a simulated “Starting Line” where they stopped and let their engines “Cackle”. 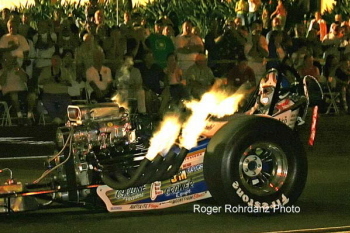 Two to three foot flames were shooting out of the headers. Nitro in the air made eyes water. 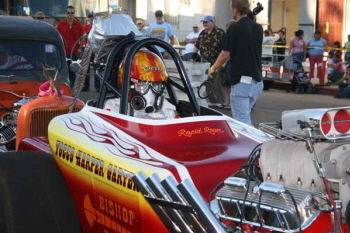 The dragsters Cackling sound made people hold their ears. 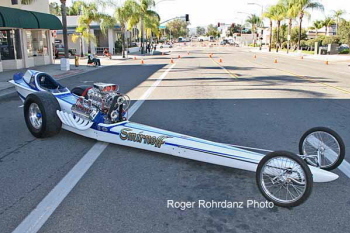 Some of the front engine Nostalgia Top Fuel Dragsters that participated in the event were: Magicar, Kuhl & Olson, Bankamericar, Mastercar, Chubasco, Paradise Alley, Poison Ivy, The Frantic Four, Stellings & Hamshire, Iron Horse, Poachers, and Shubert/Herbert. The Nostalgia Top Fuel Funny Car was Randy Walls Super Nova. The Police Department estimated the crowd at 20,000!! “Cruisin’ Grand” is free to the hundreds of cruisers and free to the thousands of spectators!! “Cruisin’ Grand” is produced by The Downtown Business Association of Escondido (contact Sue Dusharme at 760 745-8877 or www.downtownescondido.com) and is presented by Kragen Auto Parts. Future event “Themes” include; Nitro dragster night, AFX race car night, Sprint & Midget Car night, Packard night, Firetruck night, Woody night, Lakes racers night, Suede night, Willys night just to name a few!! 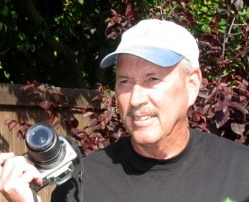 Steve Waldron of Top End Tees is the fantastic event organizer contact him at 760 746-8461, for future event info. Many other event and award sponsors and the City of Escondido make this amazing event possible. There is no question in my mind that this is the best weekly cruise in the country!! 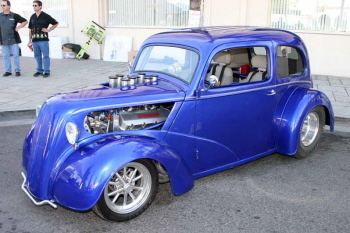 A nasty injected 555 in Dart motor, oh ya Tom Yoder of Valley Center, CA put it in a ’48 Anglia. 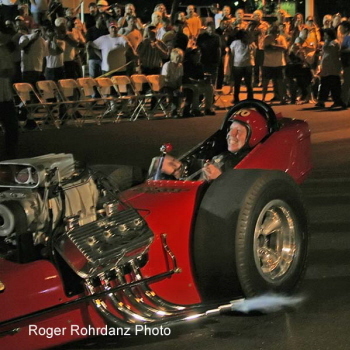 The recently restored Smirnoff nostalgia AA/F Dragster was shown tonight for the first time. As they would say, a “2 up” ’51 Merc flathead powers Frank Thacker’s ’29 Ford Tudor from Valley Center, CA. 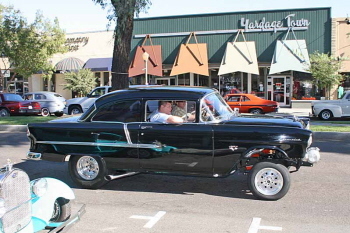 Cruising for looks and a place to park is Rod Huth from San Diego, CA in his “straight axled” 427 Chevy powered ’55 Chevy 210. 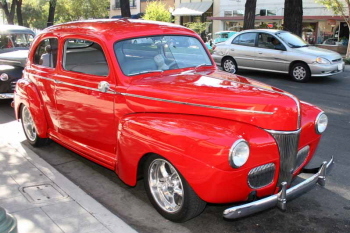 Leonard Kunce brought his clean ’41 Ford Tudor from some place called Penasquitos, CA? You see all kinds of things Cruisin’ Grand. 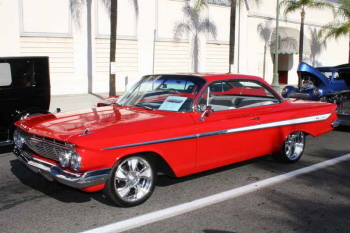 This very nice ’61 Chevy Impala belongs to Jiggs Rodrigdes of San Diego, CA. 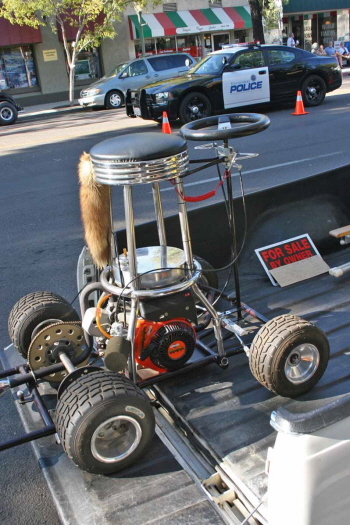 Do powered “Bar Stools” and the Police mix? I don’t think so. 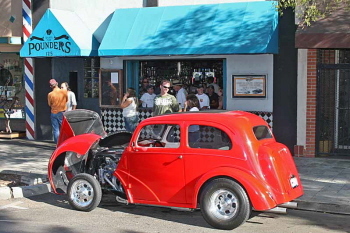 There is something about a 406 powered ’48 Anglia parked in front of a place called “Pounders”. 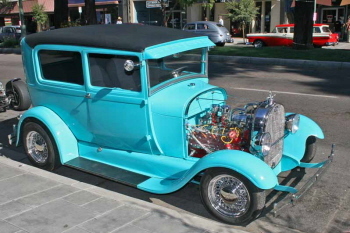 The Anglia belongs to Patrick Evans from, you won’t believe this, Nampa, Idaho! Doug Anderson from Pauma Valley, CA. drove his restored 1914 Ford. 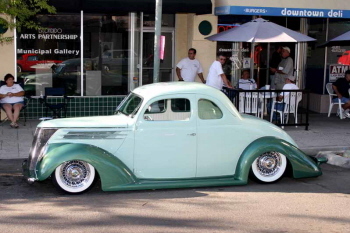 Unique styling on this ’37 Ford Coupe that Chet Miller drove from Temecula, CA. The crowd anticipates the beginning of “Nitro Night”. 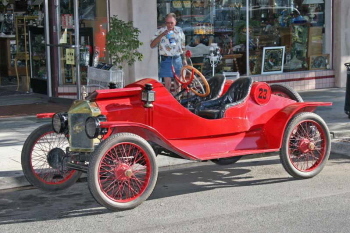 The Tocco-Harper-Garter AA/Fuel Altered, with ‘Rapid Roger’ Garter driving. 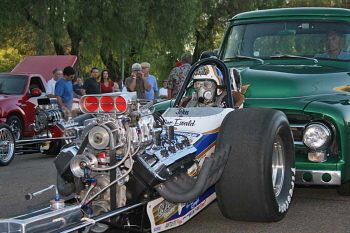 Steve Waldron in the seat of Ewald’s “Bankamericar” AA/Fuel Dragster. Carl Olson pilots the “Kuhl & Olson” AA/Fuel Dragster. 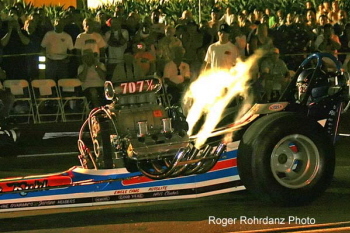 John Ewald in his Bankamericar AA/Fuel Dragster. Carl Olson and the “Kuhl & Olson” AA/Fuel Dragster. 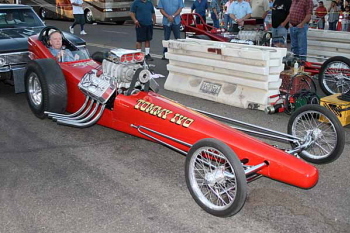 “TV Tommy” Ivo behind the wheel of his recently restored “Barnstormer” AA/Fuel Dragster. Do you think Tommy is having fun? ?